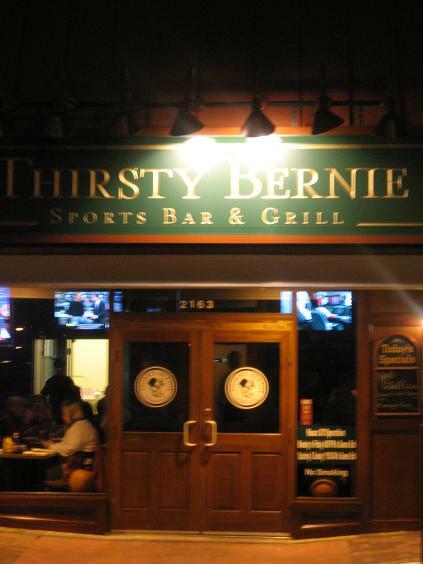 <<EDIT, 12/8 @ 3:30 PM: On Friday, several sources reported that Chef Jamie Stachowski’s with Thirsty Bernie was not renewed when it expired on November 30th. Even more disturbing, Washingtonian’s Best Bites blog quotes Stachowski as saying that owner Steve Sadeghian is planning to focus on “convenience cooking” and will be buying much of his food pre-made. Sports bar. Strip mall. Northern Virginia. Sounds awesome, right? Generally speaking, this is not a combination that screams “destination dining.” But if you haven’t heard by now, Thirsty Bernie is no run-of-the-mill sports bar. It’s a showcase for a chef who made a name for himself downtown and who now has carte blanche to indulge his creativity in an unlikely venue. I never did make it to Restaurant Kolumbia, so I can’t wax rhapsodic about the way Chef Jamie Stachowski used to impress upscale diners with his charcuterie and his novel takes on classics. Having experienced Thirsty Bernie with my father recently, however, I can definitely see what everyone is talking about. This is a place that takes meat, beer and sports seriously. And since there are very few places that simultaneously do all three well, it warrants a visit from even the most NoVAphobic Washingtonian.